The rescue of the two-year-old boy who has been in a 110-meter-long well for nine days constitutes “an extreme and unprecedented situation” due to the “urgency” and complexity of the case , said the Government delegate in the Spanish region on Tuesday. Andalusia (south), Alfonso Rodríguez. The operation , which keeps the whole country in suspense, faced new technical problems that delayed the work , and the government delegate tried to explain the complicated situation faced by technicians and workers. The parallel vertical tunnel that had been excavated could not be used due to technical problems , but the jacket (the inner pipe) that was wanted to be introduced to secure the walls did not enter due to some type of inequality, so it was decided to increase the diameter of the excavation. Once the tunnel has been piped, a small cage will be lowered with an elite mining rescue team specifically arrived from the coal region of Asturias (north). The miners will have to dig by hand a side gallery about four meters long until they are believed to be the child. The small Julen fell the past day 13 to a well of prospection of water , a conduit of 25 centimeters of diameter and 107 meters of length, which unchained an operation of rescue without precedents in Spain. Rodriguez stressed the “impressive” magnitude of the work, which has included the movement of some 40,000 tons of earth and rocks, since it has also had to build roads to facilitate access of heavy machinery to the site. That and previous geological studies normally require “months” under normal circumstances, he added. “We continue working tirelessly,” said the head of the rescue operation, Ángel García, in the same appearance, in which he explained the complications that arose in this last phase of the process. 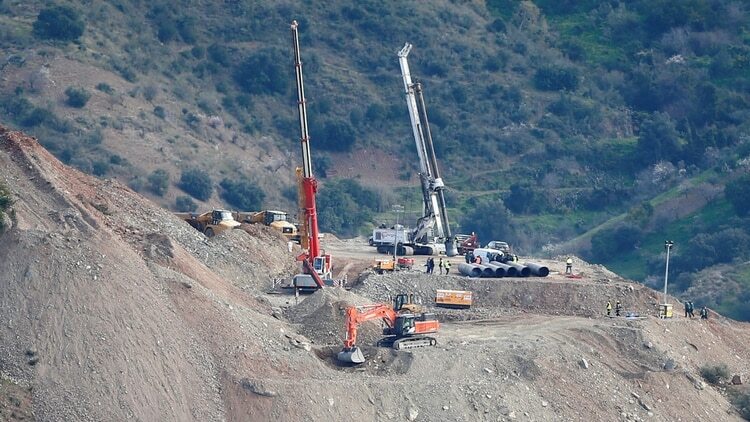 The water prospecting pit where the child fell on 13th is about 107 meters deep and about 25 centimeters in diameter, and given the impossibility of entering the interior, the technicians first decided to excavate a horizontal tunnel taking advantage of the slope of the area . But, when finding rocks of extreme hardness, it was finally decided to drill a vertical tunnel parallel to the well to access from it to the place where the child is believed to be. However, the setback will delay, maybe on another day, the beginning of the excavation of a gallery by the miners to communicate the two conduits and get to the small one.